Abiro uses Cordova (as used by PhoneGap, Ionic, XDK and many others) for some of its apps, and to facilitate that work has developed a few much needed tools. These tools are also available for anyone else to use. 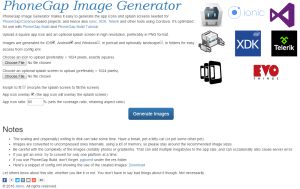 Especially PhoneGap Image Generator has become popular, with thousands of image packs having been created by others. A tutorial and template for building Cordova apps using Phone Gap Build, updated recently to the latest cli-7.0.1. Creates the image resources (icons and splash screens) needed for Cordova projects.